This is an archive of some important happenings in the development of myself as an artist. They cover travels, education and shows that occurred between 2008 and 2011. For current events see my Blog page: In & Out. In 2011, I entered both the Spring and Fall shows for the Watercolor Society of Oregon. I was juried into both shows. In the spring "White Lilies" was accepted and shown at the Jacobs Gallery in Eugene, Oregon. As a result of being in the Spring Watercolor Society show, I was also able to show my piece at the Giustina Gallery at the Oregon State University campus that summer. 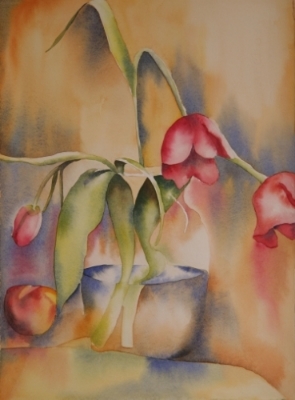 In the fall, "Calla Duet" was accepted and shown in Sunriver in Central Oregon. During this year I was also asked to be in a joint show with Lane Community College Art Faculty. Each faculty member asked one student to exhibit a piece along with them at the Gallery at the Airport in Eugene, Oregon. These opportunities to show my work were very exciting and affirming. In 2010, I was invited to do a solo private show at the Tate Condominiums in Eugene, Oregon. This was a wonderful opportunity for me to show new work to a community of art lovers. The Condominium Association had an active Art Committee which contacted local artists to show for a month in their lobby space. They threw a lovely opening reception, and it was very well attended. In 2009, I made the decision to go back to school. It started out as one term and became three terms. I wanted to study with Satoko Motouji, who has been teaching at Lane Community College for 20 years. She is a watercolor painter, as well as an oil painter. I wanted to focus on watercolor, so I took her Watercolor class for both the Winter and Spring terms. We concentrated on Still Life and the Figure in the Winter term, and Landscape in the Spring term. In the Fall, I signed up for the Figure Drawing Class in which she focused on aqueous medium, particularly watercolor. It was an exhilarating year, as well as a demanding one. I painted 85 watercolors during the year, mostly in class, and in doing so had a great learning experience. Satoko is a wonderful teacher, and I enjoyed learning from her. She helped me to gain confidence and to try things I've never tried before. In September and October of 2008, I was fortunate to be able to travel for the first time to Florence, Italy and the Tuscan countryside. I went with my husband and our very good friends, another couple, whom we have traveled with before (New Zealand, Victoria, B.C., and the Grand Canyon). It was for my 50th birthday, and I was able to set the agenda. We spent one week in Florence, which was fantastic, and then two weeks in the countryside, one near Cortona, and the final week near Montipulciano. During the course of my trip I was able to paint a couple of times; and one of my fondest memories was sitting outside for most of a day at the Villa Le Macchie where we stayed, in the glorious Italian sun, painting the beautiful landscape that surrounded me. On January 3rd, 2008, I installed 10 watercolors at a local wine shop called Winestyles. Run by a dynamic young couple, they held several events every week that appealed to people from all walks of life. They made a commitment to show works by local artists and hosted a wonderful “Meet the Artist” event for me. This was a two-month exhibit. In May of 2007 I was privileged to attend a seven-day workshop taught by my mentor, Carol Carter. The workshop was held in St. Thomas, Virgin Islands, and it was a fantastic adventure in every way. We spent a great deal of time painting, learning, talking about art and taking photos. We stayed at the Inn of the Silver Palm, run by a wonderful local woman named Susan Hunter. She enabled us to see the sights from a more local perspective and we had wonderful adventures built in around our painting time. Some of the highlights were an Eco-kayaking and snorkeling adventure at the Mangrove Lagoon, followed by lunch at Bolongo Bay. We spent a fabulous day on St. John, which ended with missing the car ferry back to St. Thomas. So we did what any trio of rational people would do…we got a tropical drink at an outdoor bar while we figured out Plan B. Our last day on the Island we were fortunate to have a local artist and fishing boat captain take us out on his boat. It was beautiful out on the water, both in the Caribbean Sea and the Atlantic Ocean. All in all, a very worthwhile trip!